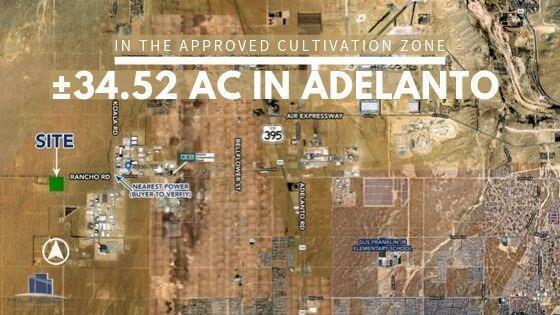 Within the approved Zone for Cannabis Cultivation! This site is located on the South side of Rancho Rd at the logical extension of Richardson Rd. Less than 400 ft South of the site are powerlines which go down the length of Powerline Rd. The property totals 34.52 Ac of vacant land in Adelanto, CA and is zoned for Industrial use. There are many other businesses within close proximity that have existing utilities to pull from (Buyer to verify all).